Hats off to all senior citizen seva dals and the youth of Mumbai for their exemplary seva, dedication and commitment. What a great job . A big SAIRAM to all of you. "Dear all devotees today you had done wonderfull job by putting all efforts. Now it is me and my blood banks turn to help you as and when you need blood for your self or dear ones .. so please call us. We will be happy to help you all. With immense blessings of our Lord & Master Bhagwan Sri Sathya Sai Baba, Mumbai city held a mega Blood donation drive today which resulted in a donation of more than 1100 bottles in one day.This is a record collection and was only possible with excellent team work , Seva bhav and HIS grace. 1)Despite extreme humid and sultry heat,the offering of Manav Seva was truly SAI SEVA. 2)Excellent teamwork and organising.Special inputs and guidance from Rajiv Jetley and Mr Gare. 3)Excellent teamwork of our seva dals with particular mention of our youth which participated in large numbers. 4)Encouraging participation of college students from different colleges like Thakur,Ruia etc. 5)Innovative skits by youth and college students on the stations to motivate public to donate the liquid of Love. 6)Healthy coordination and competition between the six stations was exemplary and very productive. 7)As we all know this camp was Swami's sankalp to give relief to the suffering in various hospitals due extreme shortage of blood which was reported in the news papers recently.We are all blessed by Bhagwan that he chose us to be part of such a seva. I pray to Swami,on behalf of all of us,to bless all immensely. Thank you Bhagawan for this wonderful opportunity. With immense blessings of Bhagwan Sri Sathya Sai Baba, Mumbai city held a Mega Blood donation drive on Saturday, 02nd June 2018 which resulted in a donation of more than 1100 bottles in one day - A record collection in itself! The Mega Blood Donation Drive in association with Western Railway Mazdoor Sangh and Central Railway Mazdoor Sangh was held at 6 Railway Stations across Mumbai including Churchgate, Dadar, Boriwali, Andheri, Ghatkopar and Mulund. Here's a trailer presenting the sneakpeak into the Blood Donation held at Dadar. Video Snippets of the Mega Blood Donation Drive by SSSSO Mumbai on 2nd June 2018 on the Western Railway. Sai's immense grace was visible in the 'Sai Festival of Liquid Love' organized all over Mumbai on Saturday, 02nd June 2018 which resulted in a donation of more than 1100 bottles in one day - A record collection in itself! It's success was due to the sheer commitment and dedication of all those involved in the Seva..
A special thanks once again to all our Sai brothers and sisters... Young and old...who were there and worked as a team. May Sai bless us all.
! Om Shri Sai Ram !! On the auspicious occasion of golden jubilee celebration of Dharmakshetra - the abode of Peace, Sri Sathya Sai Seva Oragnisation, Maharashtra & Goa, conducted Blood Donation Drive, to mitigate the problem of shortage of blood in municipal hospitals of Mumbai, at six railway stations. Mulundkars and Mumbaikars wholeheartedly supported this cause, they patiently waited in the queue for donating blood. The kind of enthusiasm shown by public was amazing and really heartening. The camp was attended by dignitaries like Shir Kirit Somaiyya, M. P., Mr. Neil Somaiyya, Shri Sardar Tara Singh, M.L.A., Shri Prakash Gangadhare, Corporator who encouraged the donors. The limelight of the camp was when a celebrity and versatile singer – Shri Sairam Iyer who is famous for singing in dual voice (male & female) visited the camp, enthralled and made an appeal to the crowd to donate blood for the bigger cause and spread Liquid Love in the society. He entertained the crowd by singing duet Hindi film songs in his God gifted voice. Mulund Camp collected 193 packets of blood and Cama Hospital doctors said that this is the highest number of blood packet collected by them in single day in camp ever held up till now. Over all response from all six camps held by Sri Sathya Sai Seva Organisation was truly brilliant. We were able to collect 1148 packets of blood in this Mega Blood Donation Drive. However, more than 400 interested donors could not donate blood as they were rejected after physical check- up. Mumbaikars have positively supported to the call given by Sri Sathya Sai Organisation and shown their love for humanity. They sweated in extreme heat of Mumbai to donate blood and spared their precious time during a working day. !!! Samastha Loka, Sukhino Bhavantu!!! Sai's immense grace was visible in the 'Sai Festival of Liquid Love' organized all over Mumbai yesterday. It's success was due to the commitment n dedication of all those involved in the Seva.. Doctors, volunteers, support staff and Mr. Gare. 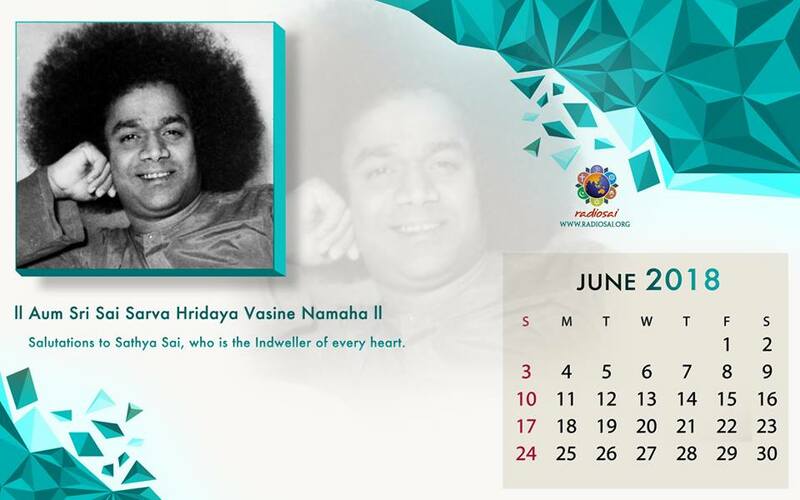 A special thanks to all our sai brothers and sisters... Young and old...who were there and worked as a team. Congratulations and God Bless. The Mega Blood Donation Drive conducted by Zone 1 in association with Western Railway Mazdoor Sangh and Central Railway Mazdoor Sangh was held at 6 Railway Stations across Mumbai including Churchgate, Dadar, Borivali, Andheri, Ghatkopar and Mulund. The Seva Dal including Senior Citizens along with the College Students from Ruia College, Matunga and the Sai Youth from Worli Samithi and Shivaji Park Samithi were appealing the commuters to Donate Blood and in turn Donate Life. Mumbaikars were the "Heroes" of the day for their extensive support! They showed why they are known for their spirit! The Railway Police Force of Central and Western Railway were instrumental in the smooth execution of the Mega Drive. As far as the numbers go, out of 1,136 packets collected from the city of Mumbai, 188 were collected from Dadar while close to 125 donors were rejected after the physical checkup. Here's dedicating at the Lotus Feet of the Master, the glimpses of the Blood Donation held at Dadar in association with KEM Hospital. 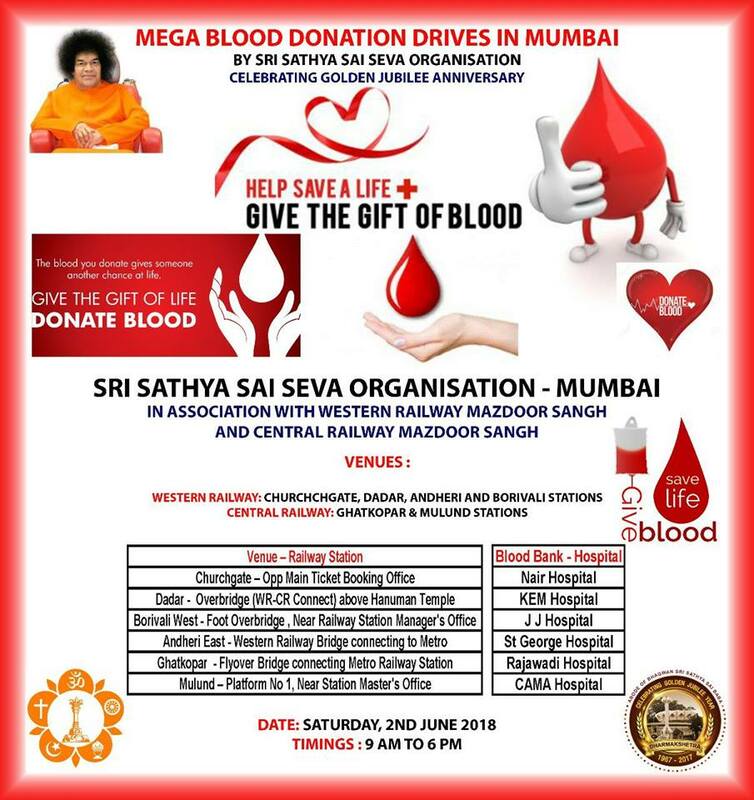 Sri Sathya Sai Seva Organization, Maharashtra and Goa - Mumbai District, has arranged a district level blood donation camp on Saturday 2nd June, 2018 as part of the Golden Jubilee celebration of Dharmakshetra. Let us come together and take this responsibility to collect and share love in the form of blood to the needy ones. This is a reminder to all of you to please attend the June Samarpan program on Sunday, the 17th, at Bhagwan's holy abode, Dharmakshetra. This month's speaker is the Former Dean of the Dept. of Management & Commerce, SSSIHL and Current Registrar of the University, Dr. B. Sai Giridhar. He belongs to one of the earliest batches of Bhagwan's University and has been serving Him for over 25 years. It will be an privilege and pleasure to listen to Dr. Sai Giridhar share the rare and magical moments in the divine proximity! Please join us with family and friends to enjoy Sai's leelas in the Divine presence. Dr. B.Sai Giridhar hails from the city of Mangalore and was a balvikas student.He was blessed to be a student of the first batch of B.Com course of the institute in the year 1982. He then completed his M.Com in the year 1987 and then he proceeded with Ph.d and completed the same in the year 1992. He was awarded the All Rounder Gold Medal by Bhagawan in the year 1986. He was part of the Institute’s brass band which was formed in the year 1985 for the sixtieth birthday of Bhagawan. Also he was the Athletic champion of the Institute in the year 1987. Bhagawan then blessed Sir to be a part of the teaching faculty in 1992 in the Brindavan campus Sir was the deputy director of Prashanthi Nilayam Campus from 2014 to 2015. Then he was appointed as H.O.D of Management and Commerce from 2015 to 2018. Currently Sir has been appointed as the new Registrar of the Institute from 2018. Please join us with family and friends for a blissful evening of Divine Leelas shared in the Divine Presence. 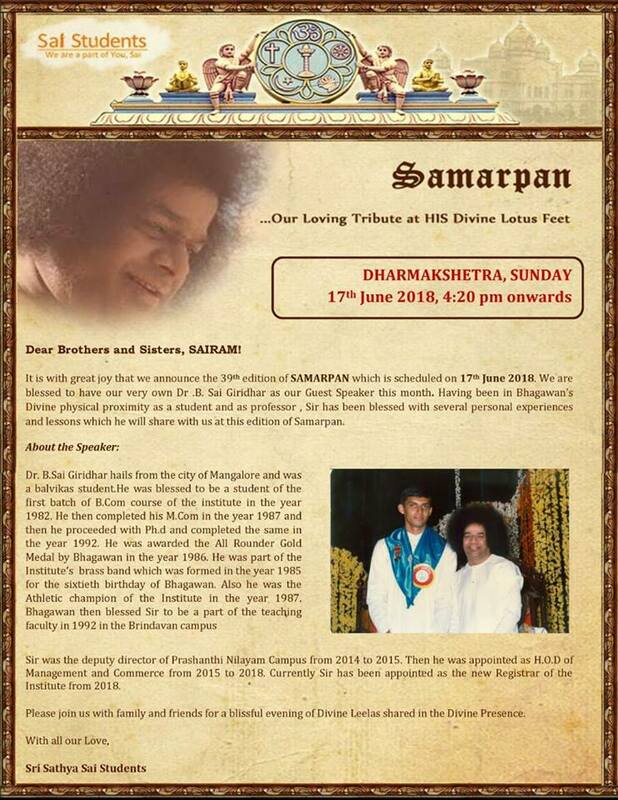 With Bhagawan’s Grace and Blessings, our 39th edition of SAMARPAN is scheduled on 17th June 2018, Sunday at the holy precincts of our very own Dharmakshetra, Mumbai. On such an occasion, we have an opportunity to listen to the leelas of the Lord from the devotees who were blessed with DIVINE association and relive those moments spent with HIM, re-connect with HIM and soak in HIS Divine presence. For this edition of SAMARPAN, we are fortunate to have Dr.B.Sai Giridhar speaking to us. He will be sharing his personal experiences and lessons learnt from the times he has spent with Bhagawan. We are sure Dr. B.Sai Giridhar is no stranger to us. He has been a long standing devotee of Bhagawan and has been appointed recently as the new Registrar of the Sri Sathya Sai Institute of Higher Learning. Kindly join us for this special edition of Samarpan with your family and friends. We also request you to spread the message to one and all so that everyone can partake the Nectar of Bhagawan's Divine Leelas.